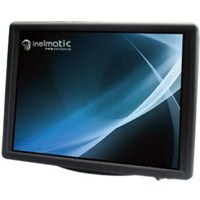 10.4 inches high grade monitor, including AFFS+ technology (transflective equivalent) with 350nits brightness.The rugged chassis design makes it perfect for harsh environments as Vehicles military applications.The XF1000 includes a high featured controller including automatic and manual backlight adjustment, depending of the ambient light, which makes it suitable for applications from the darkest night (NVIS) to the bright sun light. Besides, the XF1000 optionally includes a resistive touch panel with USB controller, adding interactivity. The XF1000 is available with VGA and Audio input as standard, optional DVI, Composite Videoand S-Video inputs. All inputs are available as factory option on the rear panel. Optionally it includes “all in one cable”, with a lockable connector for an easy and quick installation.